Reveal your family history at Ancestry.com. Ancestry.com is a trusted site used by millions to help uncover the lives of their ancestors. Ancestry.com uses census, immigration, military records, birth, marriage, and death certificates, and other resources to help dig out information. 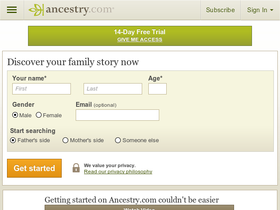 Also, Ancestry.com makes it easy to discover family past and create an online family tree. But before you get started on your adventure into the past, be sure to get all the latest Ancestry.com discounts, Ancestry.com promotions, and Ancestry.com coupon codes, found here at RetailSteal.com. Act now and save 25% off the Family Tree Maker from Ancestry.com. Click link to save. Find out about your family history with membership on Ancestry.com, now from only $15 per month. Use this coupon code online at Ancestry.com and enjoy free shipping on the Ancestry DNA Kit. Check out Ancestry.com and save 10% off their AncestryDNA kit. Click link to activate savings. Sign up at Ancestry.com today and enjoy a free 14 day trial. Click here to get started.